This week here at Northwest Academy we began our first summer camp of the season! 2nd – 5th graders are “Unleashing the Wild Side” this week. The theme of the camp is based on Maurice Sendak’s book Where the Wild Things Are. Students are engaging in a variety of project based learning activities that incorporate math, art, gross motor skills, reading, and writing. 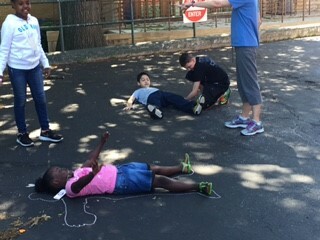 PHOTO OF THE WEEK: Students letting their imaginations run wild and creating their own “wild thing” using sidewalk chalk during this week’s summer camp. 6/20-7/1 & 7/11-7/22 = Summer School. This free program is open to students entering Grades 2-5 this coming fall. Space is limited. Students must be registered for summer school in advance. Call today to register. 6/25 – Summer Festival featuring Mad Science from 10am-12pm. Free fun and food for the whole family and open to our entire community! Swing by this event to see your friends and teachers and enjoy science experiments and lawn games. 7/15 – Family Movie Night! 5:30pm-7:30pm. Join us for pizza, popcorn, and a special screening of Zootopia! 7/25 – Summer Camp begins. This free program is open to incoming K-5th Call today to register. Space is limited. Students must be registered for summer camp in advance. Call today to register. 8/4 – Back to School BBQ for incoming K-8th Graders and their families. Meet your teacher and do orientation paperwork for the upcoming school year. If you have any questions or would like to register your child for summer school or summer camp please call us at 216-226-6800. As always, thank you for allowing us the opportunity to serve your family.